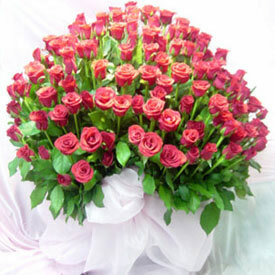 With this 200 stunning red roses, elate your special one. Surprise and bewilder him/her with this exotic red roses basket as your exclusive gift to India. Send it through RGCards.com and win their heart all over again! The beauty of the charming roses have been further enhanced with green leaves and ribbon.